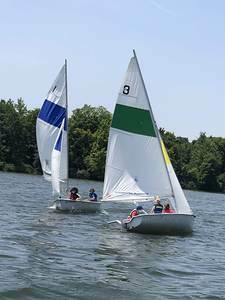 For students age 8 and up, our Junior Learn to Sail (JLTS) Camp offers the opportunity to learn sailing on a variety of small boats. Our classes run for one week and are designed to not only teach basic sailing skills, but to also to help students form meaningful relationships with peers while practicing teamwork, responsibility and many other life-skills. Camp runs from 9am until 4pm Monday through Friday, rain or shine! Each day includes learning segments on shore and on the water. As a participant in our classes students will feel comfortable and safe on boats, and excitement about the lifelong opportunities and adventure that sailing has to offer! Spaces are limited to a small number of participants, giving students an optimal student-to instructor ratio. The camp is taught by experienced sailors that are dedicated to making sailing fun and welcoming for all! Sign up quickly for the opportunity for a summer filled with fun! For course details check out JLTS Camp Details. For course weekly course schedule check out JLTS Camp Schedule. For course fees & registration information check out JLTS Camp Fees & Registration.